The classic granny design gets a chic upgrade for today's style in this pretty floral bag. Cotton yarn makes it durable and easy to care for. 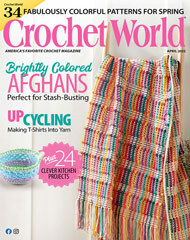 This e-pattern was originally published in the May 2011 issue of Crochet! magazine. Size: 8" x 10", excluding strap. Made with light (light worsted) weight yarn and sizes F/5/3.75mm and G/6/4mm hooks.